On page 3783, Yost et al. identify a peptide in umbilical cord blood that inhibits NET formation in neutrophils isolated from neonates and adults. 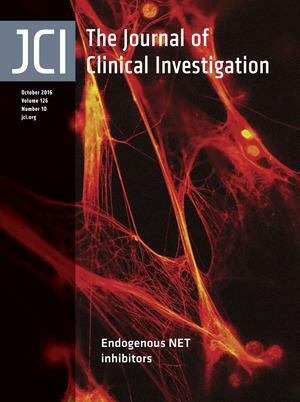 The cover image shows NET formation by LPS-stimulated neutrophils isolated from a 3-day-old preterm infant. Image credit: Diana Lim. Citation Information: J Clin Invest. 2016;126(10):3627-3627. https://doi.org/10.1172/JCI90166. Much has been written already about whether the scientific machine is churning out too many PhDs and postdocs when there are a limited number of academic jobs and the competition for funding and space in competitive journals is intense. But gratifyingly, there exists a vast array of other scientific careers. We need to mentor and advise trainees about the diverse and rewarding professional opportunities that are available beyond the postdoctoral apprenticeship period. Citation Information: J Clin Invest. 2016;126(10):3628-3638. https://doi.org/10.1172/JCI90055. Citation Information: J Clin Invest. 2016;126(10):3639-3644. https://doi.org/10.1172/JCI90179. Citation Information: J Clin Invest. 2016;126(10):3645-3650. https://doi.org/10.1172/JCI90289. Citation Information: J Clin Invest. 2016;126(10):3651-3660. https://doi.org/10.1172/JCI87439. In the past decade, new approaches have been explored that are aimed at restoring functional β cell mass as a treatment strategy for diabetes. The two most intensely pursued strategies are β cell replacement through conversion of other cell types and β cell regeneration by enhancement of β cell replication. The approach closest to clinical implementation is the replacement of β cells with human pluripotent stem cell–derived (hPSC-derived) cells, which are currently under investigation in a clinical trial to assess their safety in humans. In addition, there has been success in reprogramming developmentally related cell types into β cells. Reprogramming approaches could find therapeutic applications by inducing β cell conversion in vivo or by reprogramming cells ex vivo followed by implantation. Finally, recent studies have revealed novel pharmacologic targets for stimulating β cell replication. Manipulating these targets or the pathways they regulate could be a strategy for promoting the expansion of residual β cells in diabetic patients. Here, we provide an overview of progress made toward β cell replacement and regeneration and discuss promises and challenges for clinical implementation of these strategies. Citation Information: J Clin Invest. 2016;126(10):3661-3671. https://doi.org/10.1172/JCI84426. Hypoxia is a prominent characteristic of many acute or chronic inflammatory diseases, and exerts significant influence on their progression. Macrophages and neutrophils are major cellular components of innate immunity and contribute not only to O2 deprivation at the site of inflammation, but also alter many of their functions in response to hypoxia to either facilitate or suppress inflammation. Hypoxia stabilizes HIF-αs in macrophages and neutrophils, and these O2-sensitive transcription factors are key regulators of inflammatory responses in myeloid cells. In this review, we will summarize our current understanding of the role of HIF-αs in shaping macrophage and neutrophil functions in the pathogenesis and progression of multiple inflammatory diseases. Citation Information: J Clin Invest. 2016;126(10):3672-3679. https://doi.org/10.1172/JCI84427. The role of tumor-associated macrophages (TAMs) in cancer is often correlated with poor prognosis, even though this statement should be interpreted with care, as the effects of macrophages primarily depend on their localization within the tumor. This versatile cell type orchestrates a broad spectrum of biological functions and exerts very complex and even opposing functions on cell death, immune stimulation or suppression, and angiogenesis, resulting in an overall pro- or antitumoral effect. We are only beginning to understand the environmental cues that contribute to transient retention of macrophages in a specific phenotype. It has become clear that hypoxia shapes and induces specific macrophage phenotypes that serve tumor malignancy, as hypoxia promotes immune evasion, angiogenesis, tumor cell survival, and metastatic dissemination. Additionally, TAMs in the hypoxic niches within the tumor are known to mediate resistance to several anticancer treatments and to promote cancer relapse. Thus, a careful characterization and understanding of this macrophage differentiation state is needed in order to efficiently tailor cancer therapy. Citation Information: J Clin Invest. 2016;126(10):3689-3698. https://doi.org/10.1172/JCI84430. The tumor immune response is in a dynamic balance between antitumor mechanisms, which serve to decrease cancer growth, and the protumor inflammatory response, which increases immune tolerance, cell survival, and proliferation. Hypoxia and expression of HIF-1α and HIF-2α are characteristic features of all solid tumors. HIF signaling serves as a major adaptive mechanism in tumor growth in a hypoxic microenvironment. HIFs represent a critical signaling node in the switch to protumorigenic inflammatory responses through recruitment of protumor immune cells and altered immune cell effector functions to suppress antitumor immune responses and promote tumor growth through direct growth-promoting cytokine production, angiogenesis, and ROS production. Modulating HIF function will be an important mechanism to dampen the tumor-promoting inflammatory response and inhibit cancer growth. Citation Information: J Clin Invest. 2016;126(10):3699-3707. https://doi.org/10.1172/JCI84431. HIF1α is a common component of pathways involved in the control of cellular metabolism and has a role in regulating immune cell effector functions. Additionally, HIF1α is critical for the maturation of dendritic cells and for the activation of T cells. HIF1α is induced in LPS-activated macrophages, where it is critically involved in glycolysis and the induction of proinflammatory genes, notably Il1b. The mechanism of LPS-stimulated HIF1α induction involves succinate, which inhibits prolyl hydroxylases (PHDs). Pyruvate kinase M2 (PKM2) is also induced and interacts with and promotes the function of HIF1α. In another critical inflammatory cell type, Th17 cells, HIF1α acts via the retinoic acid–related orphan receptor-γt (RORγt) to drive Th17 differentiation. HIF1α is therefore a key reprogrammer of metabolism in inflammatory cells that promotes inflammatory gene expression. Citation Information: J Clin Invest. 2016;126(10):3708-3715. https://doi.org/10.1172/JCI84432. Radiotherapy is an effective treatment strategy for cancer, but a significant proportion of patients experience radiation-induced toxicity due to damage to normal tissue in the irradiation field. The use of chemical or biological approaches aimed at reducing or preventing normal tissue toxicity induced by radiotherapy is a long-held goal. Hypoxia-inducible factors (HIFs) regulate the production of factors that may protect several cellular compartments affected by radiation-induced toxicity. Pharmacological inhibitors of prolyl hydroxylase domain–containing enzymes (PHDs), which result in stabilization of HIFs, have recently been proposed as a new class of radioprotectors. In this review, radiation-induced toxicity in the gastrointestinal (GI) tract and the main cellular compartments studied in this context will be discussed. The effects of PHD inhibition on GI radioprotection will be described in detail. Citation Information: J Clin Invest. 2016;126(10):3716-3724. https://doi.org/10.1172/JCI84433. Uncontrolled inflammation underpins a diverse range of diseases where effective therapy remains an unmet clinical need. Hypoxia is a prominent feature of the inflammatory microenvironment that regulates key transcription factors including HIF and NF-κB in both innate and adaptive immune cells. In turn, altered activity of the pathways controlled by these factors can affect the course of inflammation through the regulation of immune cell development and function. In this review, we will discuss these pathways and the oxygen sensors that confer hypoxic sensitivity in immune cells. Furthermore, we will describe how hypoxia-dependent pathways contribute to immunity and discuss their potential as therapeutic targets in inflammatory and infectious disease. Citation Information: J Clin Invest. 2016;126(10):3725-3727. https://doi.org/10.1172/JCI90188. Recent findings have linked brain swelling to death in cerebral malaria (CM). These observations have prompted a number of investigations into the mechanisms of this pathology with the goal of identifying potential therapeutic targets. In this issue of the JCI, Gallego-Delgado and colleagues present evidence that implicates angiotensin receptors and the relocation of β-catenin to the endothelial cell nucleus in CM. This study provides a renewed focus on infected erythrocyte debris as the cause of endothelial damage and challenges previous work implicating direct effects of infected erythrocyte sequestration in the brain as the major driver of disease. While this work provides potential therapeutic avenues for CM, it leaves a number of questions unanswered. Citation Information: J Clin Invest. 2016;126(10):3728-3730. https://doi.org/10.1172/JCI90198. Dysregulation of the type 2 immune system presents with various manifestations, including allergic inflammation, and has emerged as an alarming public health issue. The pathological mechanisms that underlie T helper type 2 cell–driven (Th2-driven) allergic diseases remain unclear. In particular, it is not completely understood how type 2 immunity is restricted in inflammatory responses. In this issue of the JCI, Lexmond et al. use Wiskott-Aldrich syndrome as a model disease and establish that the Wiskott-Aldrich gene product (WASP) serves an essential role in T regulatory cells to contain Th2 effector cell differentiation and prevent allergic sensitization to dietary antigens. Citation Information: J Clin Invest. 2016;126(10):3731-3734. https://doi.org/10.1172/JCI90348. Atrial fibrillation (AF) is a cardiac arrhythmia that arises from electrical and contractile dysfunction in the atria. Atrial function is regulated by a variety of intracellular signaling networks that facilitate rapid communication and coordinate responses of atrial myocytes. In this issue of the JCI, Brandenburg and colleagues describe the identification and characterization of “super-hub” signaling nodes located on atrial axial tubules that regulate atrial contraction. Together, the results of this study provide important insight into the regulation of atrial contraction and describe potential therapeutic targets to be explored in future studies. Citation Information: J Clin Invest. 2016;126(10):3735-3738. https://doi.org/10.1172/JCI90361. Mast cells (MCs) are present in various tissues and are responsible for initiating many of the early inflammatory responses to extrinsic challenges. Recent studies have demonstrated that MCs can tailor their responses, depending on the stimulus encountered and the tissue in which they are stimulated. In this issue of the JCI, Gaudenzio and colleagues examine the mechanistic differences between MC responses observed after engagement of Fcε receptor I and those seen after MC stimulation via the recently identified G protein–coupled receptor MRGPRX2. By showing that discrete cellular activation patterns affect the phenotype of the MC response in vivo and in vitro, the authors provide important information about how MCs differentially process various stimuli into distinct degranulation programs. Citation Information: J Clin Invest. 2016;126(10):3739-3757. https://doi.org/10.1172/JCI81568. Triple-negative breast cancer (TNBC) includes basal-like and claudin-low subtypes for which no specific treatment is currently available. Although the retinoblastoma tumor-suppressor gene (RB1) is frequently lost together with TP53 in TNBC, it is not directly targetable. There is thus great interest in identifying vulnerabilities downstream of RB1 that can be therapeutically exploited. Here, we determined that combined inactivation of murine Rb and p53 in diverse mammary epithelial cells induced claudin-low–like TNBC with Met, Birc2/3-Mmp13-Yap1, and Pvt1-Myc amplifications. Gene set enrichment analysis revealed that Rb/p53-deficient tumors showed elevated expression of the mitochondrial protein translation (MPT) gene pathway relative to tumors harboring p53 deletion alone. Accordingly, bioinformatic, functional, and biochemical analyses showed that RB1-E2F complexes bind to MPT gene promoters to regulate transcription and control MPT. Additionally, a screen of US Food and Drug Administration–approved (FDA-approved) drugs identified the MPT antagonist tigecycline (TIG) as a potent inhibitor of Rb/p53-deficient tumor cell proliferation. TIG preferentially suppressed RB1-deficient TNBC cell proliferation, targeted both the bulk and cancer stem cell fraction, and strongly attenuated xenograft growth. It also cooperated with sulfasalazine, an FDA-approved inhibitor of cystine xCT antiporter, in culture and xenograft assays. Our results suggest that RB1 deficiency promotes cancer cell proliferation in part by enhancing mitochondrial function and identify TIG as a clinically approved drug for RB1-deficient TNBC. Citation Information: J Clin Invest. 2016;126(10):3758-3771. https://doi.org/10.1172/JCI84440. Studies of the genetic factors associated with human autoimmune disease suggest a multigenic origin of susceptibility; however, how these factors interact and through which tolerance pathways they operate generally remain to be defined. One key checkpoint occurs through the activity of the autoimmune regulator AIRE, which promotes central T cell tolerance. Recent reports have described a variety of dominant-negative AIRE mutations that likely contribute to human autoimmunity to a greater extent than previously thought. In families with these mutations, the penetrance of autoimmunity is incomplete, suggesting that other checkpoints play a role in preventing autoimmunity. Here, we tested whether a defect in LYN, an inhibitory protein tyrosine kinase that is implicated in systemic autoimmunity, could combine with an Aire mutation to provoke organ-specific autoimmunity. Indeed, mice with a dominant-negative allele of Aire and deficiency in LYN spontaneously developed organ-specific autoimmunity in the eye. We further determined that a small pool of retinal protein–specific T cells escaped thymic deletion as a result of the hypomorphic Aire function and that these cells also escaped peripheral tolerance in the presence of LYN-deficient dendritic cells, leading to highly destructive autoimmune attack. These findings demonstrate how 2 distinct tolerance pathways can synergize to unleash autoimmunity and have implications for the genetic susceptibility of autoimmune disease. Citation Information: J Clin Invest. 2016;126(10):3772-3782. https://doi.org/10.1172/JCI86923. NK cells are innate lymphocytes with protective functions against viral infections and tumor formation. Human NK cells carry inhibitory killer cell Ig-like receptors (KIRs), which recognize distinct HLAs. NK cells with KIRs for self-HLA molecules acquire superior cytotoxicity against HLA– tumor cells during education for improved missing-self recognition. Here, we reconstituted mice with human hematopoietic cells from donors with homozygous KIR ligands or with a mix of hematopoietic cells from these homozygous donors, allowing assessment of the resulting KIR repertoire and NK cell education. We found that co-reconstitution with 2 KIR ligand–mismatched compartments did not alter the frequency of KIR-expressing NK cells. However, NK cell education was diminished in mice reconstituted with parallel HLA compartments due to a lack of cognate HLA molecules on leukocytes for the corresponding KIRs. This change in NK cell education in mixed human donor–reconstituted mice improved NK cell–mediated immune control of EBV infection, indicating that mixed hematopoietic cell populations could be exploited to improve NK cell reactivity against leukotropic pathogens. Taken together, these findings indicate that leukocytes lacking cognate HLA ligands can disarm KIR+ NK cells in a manner that may decrease HLA– tumor cell recognition but allows for improved NK cell–mediated immune control of a human γ-herpesvirus. Citation Information: J Clin Invest. 2016;126(10):3783-3798. https://doi.org/10.1172/JCI83873. Neutrophil granulocytes, also called polymorphonuclear leukocytes (PMNs), extrude molecular lattices of decondensed chromatin studded with histones, granule enzymes, and antimicrobial peptides that are referred to as neutrophil extracellular traps (NETs). NETs capture and contain bacteria, viruses, and other pathogens. Nevertheless, experimental evidence indicates that NETs also cause inflammatory vascular and tissue damage, suggesting that identifying pathways that inhibit NET formation may have therapeutic implications. Here, we determined that neonatal NET-inhibitory factor (nNIF) is an inhibitor of NET formation in umbilical cord blood. In human neonatal and adult neutrophils, nNIF inhibits key terminal events in NET formation, including peptidyl arginine deiminase 4 (PAD4) activity, neutrophil nuclear histone citrullination, and nuclear decondensation. We also identified additional nNIF-related peptides (NRPs) that inhibit NET formation. nNIFs and NRPs blocked NET formation induced by pathogens, microbial toxins, and pharmacologic agonists in vitro and in mouse models of infection and systemic inflammation, and they improved mortality in murine models of systemic inflammation, which are associated with NET-induced collateral tissue injury. The identification of NRPs as neutrophil modulators that selectively interrupt NET generation at critical steps suggests their potential as therapeutic agents. Furthermore, our results indicate that nNIF may be an important regulator of NET formation in fetal and neonatal inflammation. Citation Information: J Clin Invest. 2016;126(10):3799-3813. https://doi.org/10.1172/JCI87041. Suppression of CD8 and CD4 T cells is a hallmark in chronic viral infections, including hepatitis C and HIV. While multiple pathways are known to inhibit CD8 T cells, the host molecules that restrict CD4 T cell responses are less understood. Here, we used inducible and CD4 T cell–specific deletion of the gene encoding the TGF-β receptor during chronic lymphocytic choriomeningitis virus infection in mice, and determined that TGF-β signaling restricted proliferation and terminal differentiation of antiviral CD4 T cells. TGF-β signaling also inhibited a cytotoxic program that includes granzymes and perforin expression at both early and late stages of infection in vivo and repressed the transcription factor eomesodermin. Overexpression of eomesodermin was sufficient to recapitulate in great part the phenotype of TGF-β receptor–deficient CD4 T cells, while SMAD4 was necessary for CD4 T cell accumulation and differentiation. TGF-β signaling also restricted accumulation and differentiation of CD4 T cells and reduced the expression of cytotoxic molecules in mice and humans infected with other persistent viruses. These data uncovered an eomesodermin-driven CD4 T cell program that is continuously suppressed by TGF-β signaling. During chronic viral infection, this program limits CD4 T cell responses while maintaining CD4 T helper cell identity. Citation Information: J Clin Invest. 2016;126(10):3814-3826. https://doi.org/10.1172/JCI87366. Citation Information: J Clin Invest. 2016;126(10):3827-3836. https://doi.org/10.1172/JCI82908. Upfront resistance to chemotherapy and relapse following remission are critical problems in leukemia that are generally attributed to subpopulations of chemoresistant tumor cells. There are, however, limited means for prospectively identifying these subpopulations, which hinders an understanding of therapeutic resistance. BH3 profiling is a functional single-cell analysis using synthetic BCL-2 BH3 domain–like peptides that measures mitochondrial apoptotic sensitivity or “priming.” Here, we observed that the extent of apoptotic priming is heterogeneous within multiple cancer cell lines and is not the result of experimental noise. Apoptotic priming was also heterogeneous in treatment-naive primary human acute myeloid leukemia (AML) myeloblasts, and this heterogeneity decreased in chemotherapy-treated AML patients. The priming of the most apoptosis-resistant tumor cells, rather than the median priming of the population, best predicted patient response to induction chemotherapy. For several patients, these poorly primed subpopulations of AML tumor cells were enriched for antiapoptotic proteins. Developing techniques to identify and understand these apoptosis-insensitive subpopulations of tumor cells may yield insights into clinical chemoresistance and potentially improve therapeutic outcomes in AML. Citation Information: J Clin Invest. 2016;126(10):3837-3851. https://doi.org/10.1172/JCI85774. Wiskott-Aldrich syndrome (WAS) is associated with mutations in the WAS protein (WASp), which plays a critical role in the initiation of T cell receptor–driven (TCR-driven) actin polymerization. The clinical phenotype of WAS includes susceptibility to infection, allergy, autoimmunity, and malignancy and overlaps with the symptoms of dedicator of cytokinesis 8 (DOCK8) deficiency, suggesting that the 2 syndromes share common pathogenic mechanisms. Here, we demonstrated that the WASp-interacting protein (WIP) bridges DOCK8 to WASp and actin in T cells. We determined that the guanine nucleotide exchange factor activity of DOCK8 is essential for the integrity of the subcortical actin cytoskeleton as well as for TCR-driven WASp activation, F-actin assembly, immune synapse formation, actin foci formation, mechanotransduction, T cell transendothelial migration, and homing to lymph nodes, all of which also depend on WASp. These results indicate that DOCK8 and WASp are in the same signaling pathway that links TCRs to the actin cytoskeleton in TCR-driven actin assembly. Further, they provide an explanation for similarities in the clinical phenotypes of WAS and DOCK8 deficiency. Citation Information: J Clin Invest. 2016;126(10):3852-3867. https://doi.org/10.1172/JCI86028. Inhibition of VLDL secretion reduces plasma levels of atherogenic apolipoprotein B (apoB) lipoproteins but can also cause hepatic steatosis. Approaches targeting apoB synthesis, which lies upstream of VLDL secretion, have potential to effectively reduce dyslipidemia but can also lead to hepatic accumulation of unsecreted triglycerides (TG). Here, we found that treating mice with apoB antisense oligonucleotides (ASOs) for 6 weeks decreased VLDL secretion and plasma cholesterol without causing steatosis. The absence of steatosis was linked to an increase in ER stress in the first 3 weeks of ASO treatment, followed by development of ER autophagy at the end of 6 weeks of treatment. The latter resulted in increased fatty acid (FA) oxidation that was inhibited by both chloroquine and 3-methyl adenine, consistent with trafficking of ER TG through the autophagic pathway before oxidation. These findings support the concept that inhibition of apoB synthesis traps lipids that have been transferred to the ER by microsomal TG transfer protein (MTP), inducing ER stress. ER stress then triggers ER autophagy and subsequent lysosomal lipolysis of TG, followed by mitochondrial oxidation of released FA, leading to prevention of steatosis. The identification of this pathway indicates that inhibition of VLDL secretion remains a viable target for therapies aiming to reduce circulating levels of atherogenic apoB lipoproteins. Citation Information: J Clin Invest. 2016;126(10):3868-3878. https://doi.org/10.1172/JCI87885. Reducing expression of the fetal hemoglobin (HbF) repressor BCL11A leads to a simultaneous increase in γ-globin expression and reduction in β-globin expression. Thus, there is interest in targeting BCL11A as a treatment for β-hemoglobinopathies, including sickle cell disease (SCD) and β-thalassemia. Here, we found that using optimized shRNAs embedded within an miRNA (shRNAmiR) architecture to achieve ubiquitous knockdown of BCL11A profoundly impaired long-term engraftment of both human and mouse hematopoietic stem cells (HSCs) despite a reduction in nonspecific cellular toxicities. BCL11A knockdown was associated with a substantial increase in S/G2-phase human HSCs after engraftment into immunodeficient (NSG) mice, a phenotype that is associated with HSC exhaustion. Lineage-specific, shRNAmiR-mediated suppression of BCL11A in erythroid cells led to stable long-term engraftment of gene-modified cells. Transduced primary normal or SCD human HSCs expressing the lineage-specific BCL11A shRNAmiR gave rise to erythroid cells with up to 90% reduction of BCL11A protein. These erythrocytes demonstrated 60%–70% γ-chain expression (vs. < 10% for negative control) and a corresponding increase in HbF. Transplantation of gene-modified murine HSCs from Berkeley sickle cell mice led to a substantial improvement of sickle-associated hemolytic anemia and reticulocytosis, key pathophysiological biomarkers of SCD. These data form the basis for a clinical trial application for treating sickle cell disease. Citation Information: J Clin Invest. 2016;126(10):3879-3893. https://doi.org/10.1172/JCI84164. Citation Information: J Clin Invest. 2016;126(10):3894-3904. https://doi.org/10.1172/JCI88950. Ventricular arrhythmias are among the most severe complications of heart disease and can result in sudden cardiac death. Patients at risk currently receive implantable defibrillators that deliver electrical shocks to terminate arrhythmias on demand. However, strong electrical shocks can damage the heart and cause severe pain. Therefore, we have tested optogenetic defibrillation using expression of the light-sensitive channel channelrhodopsin-2 (ChR2) in cardiac tissue. Epicardial illumination effectively terminated ventricular arrhythmias in hearts from transgenic mice and from WT mice after adeno-associated virus–based gene transfer of ChR2. We also explored optogenetic defibrillation for human hearts, taking advantage of a recently developed, clinically validated in silico approach for simulating infarct-related ventricular tachycardia (VT). Our analysis revealed that illumination with red light effectively terminates VT in diseased, ChR2-expressing human hearts. Mechanistically, we determined that the observed VT termination is due to ChR2-mediated transmural depolarization of the myocardium, which causes a block of voltage-dependent Na+ channels throughout the myocardial wall and interrupts wavefront propagation into illuminated tissue. Thus, our results demonstrate that optogenetic defibrillation is highly effective in the mouse heart and could potentially be translated into humans to achieve nondamaging and pain-free termination of ventricular arrhythmia. Citation Information: J Clin Invest. 2016;126(10):3905-3916. https://doi.org/10.1172/JCI85329. Immune surveillance in tissues is mediated by a long-lived subset of tissue-resident memory T cells (Trm cells). A putative subset of tissue-resident long-lived stem cells is characterized by the ability to efflux Hoechst dyes and is referred to as side population (SP) cells. Here, we have characterized a subset of SP T cells (Tsp cells) that exhibit a quiescent (G0) phenotype in humans and mice. Human Trm cells in the gut and BM were enriched in Tsp cells that were predominantly in the G0 stage of the cell cycle. Moreover, in histone 2B-GFP mice, the 2B-GFP label was retained in Tsp cells, indicative of a slow-cycling phenotype. Human Tsp cells displayed a distinct gene-expression profile that was enriched for genes overexpressed in Trm cells. In mice, proteins encoded by Tsp signature genes, including nuclear receptor subfamily 4 group A member 1 (NR4A1) and ATP-binding cassette (ABC) transporters, influenced the function and differentiation of Trm cells. Responses to adoptive transfer of human Tsp cells into immune-deficient mice and plerixafor therapy suggested that human Tsp cell mobilization could be manipulated as a potential cellular therapy. These data identify a distinct subset of human T cells with a quiescent/slow-cycling phenotype, propensity for tissue enrichment, and potential to mobilize into circulation, which may be harnessed for adoptive cellular therapy. Citation Information: J Clin Invest. 2016;126(10):3917-3928. https://doi.org/10.1172/JCI86953. Members of the NLR family can assemble inflammasome complexes with the adaptor protein ASC and caspase-1 that result in the activation of caspase-1 and the release of IL-1β and IL-18. Although the NLRC4 inflammasome is known to have a protective role in tumorigenesis, there is an increased appreciation for the inflammasome-independent actions of NLRC4. Here, we utilized a syngeneic subcutaneous murine model of B16F10 melanoma to explore the role of NLRC4 in tumor suppression. We found that NLRC4-deficient mice exhibited enhanced tumor growth that was independent of the inflammasome components ASC and caspase-1. Nlrc4 expression was critical for cytokine and chemokine production in tumor-associated macrophages and was necessary for the generation of protective IFN-γ–producing CD4+ and CD8+ T cells. Tumor progression was diminished when WT or caspase-1–deficient, but not NLRC4-deficient, macrophages were coinjected with B16F10 tumor cells in NLRC4-deficient mice. Finally, examination of human primary melanomas revealed the extensive presence of NLRC4+ tumor-associated macrophages. In contrast, there was a paucity of NLRC4+ tumor-associated macrophages observed in human metastatic melanoma, supporting the concept that NLRC4 expression controls tumor growth. These results reveal a critical role for NLRC4 in suppressing tumor growth in an inflammasome-independent manner. Citation Information: J Clin Invest. 2016;126(10):3929-3941. https://doi.org/10.1172/JCI87414. Duchenne muscular dystrophy (DMD) is a severe and progressive muscle-wasting disease caused by mutations in the dystrophin gene. Although dystrophin deficiency in myofiber triggers the disease’s pathological changes, the degree of satellite cell (SC) dysfunction defines disease progression. Here, we have identified chicken ovalbumin upstream promoter–transcription factor II (COUP-TFII) hyperactivity as a contributing factor underlying muscular dystrophy in a dystrophin-deficient murine model of DMD. Ectopic expression of COUP-TFII in murine SCs led to Duchenne-like dystrophy in the muscles of control animals and exacerbated degenerative myopathies in dystrophin-deficient mice. COUP-TFII–overexpressing mice exhibited regenerative failure that was attributed to deficient SC proliferation and myoblast fusion. Mechanistically, we determined that COUP-TFII coordinated a regenerative program through combined regulation of multiple promyogenic factors. Furthermore, inhibition of COUP-TFII preserved SC function and counteracted the muscle weakness associated with Duchenne-like dystrophy in the murine model, suggesting that targeting COUP-TFII is a potential treatment for DMD. Together, our findings reveal a regulatory role of COUP-TFII in the development of muscular dystrophy and open up a potential therapeutic opportunity for managing disease progression in patients with DMD. Citation Information: J Clin Invest. 2016;126(10):3942-3960. https://doi.org/10.1172/JCI88546. Protective T cell memory is an acquired trait that is contingent upon the preservation of its constituents and therefore vulnerable to the potentially deleterious effects of organismal aging. Here, however, we have found that long-term T cell memory in a natural murine host-pathogen system can substantially improve over time. Comprehensive molecular, phenotypic, and functional profiling of aging antiviral CD8+ memory T cells (CD8+ TM) revealed a pervasive remodeling process that promotes the gradual acquisition of distinct molecular signatures, of increasingly homogeneous phenotypes, and of diversified functionalities that combine to confer a CD8+ TM–autonomous capacity for enhanced recall responses and immune protection. Notably, the process of CD8+ TM aging is characterized by a progressive harmonization of memory and naive T cell traits, is broadly amenable to experimental acceleration or retardation, and serves as a constitutional component for the “rebound model” of memory T cell maturation. By casting CD8+ TM populations within the temporal framework of their slowly evolving properties, this model establishes a simple ontogenetic perspective on the principal organization of CD8+ T cell memory that may directly inform the development of improved diagnostic, prophylactic, and therapeutic modalities. Citation Information: J Clin Invest. 2016;126(10):3961-3980. https://doi.org/10.1172/JCI85239. Imatinib-insensitive leukemia stem cells (LSCs) are believed to be responsible for resistance to BCR-ABL tyrosine kinase inhibitors and relapse of chronic myelogenous leukemia (CML). Identifying therapeutic targets to eradicate CML LSCs may be a strategy to cure CML. In the present study, we discovered a positive feedback loop between BCR-ABL and protein arginine methyltransferase 5 (PRMT5) in CML cells. Overexpression of PRMT5 was observed in human CML LSCs. Silencing PRMT5 with shRNA or blocking PRMT5 methyltransferase activity with the small-molecule inhibitor PJ-68 reduced survival, serial replating capacity, and long-term culture-initiating cells (LTC-ICs) in LSCs from CML patients. Further, PRMT5 knockdown or PJ-68 treatment dramatically prolonged survival in a murine model of retroviral BCR-ABL–driven CML and impaired the in vivo self-renewal capacity of transplanted CML LSCs. PJ-68 also inhibited long-term engraftment of human CML CD34+ cells in immunodeficient mice. Moreover, inhibition of PRMT5 abrogated the Wnt/β-catenin pathway in CML CD34+ cells by depleting dishevelled homolog 3 (DVL3). This study suggests that epigenetic methylation modification on histone protein arginine residues is a regulatory mechanism to control self-renewal of LSCs and indicates that PRMT5 may represent a potential therapeutic target against LSCs. Citation Information: J Clin Invest. 2016;126(10):3981-3998. https://doi.org/10.1172/JCI85538. Mast cells (MCs) influence intercellular communication during inflammation by secreting cytoplasmic granules that contain diverse mediators. Here, we have demonstrated that MCs decode different activation stimuli into spatially and temporally distinct patterns of granule secretion. Certain signals, including substance P, the complement anaphylatoxins C3a and C5a, and endothelin 1, induced human MCs rapidly to secrete small and relatively spherical granule structures, a pattern consistent with the secretion of individual granules. Conversely, activating MCs with anti-IgE increased the time partition between signaling and secretion, which was associated with a period of sustained elevation of intracellular calcium and formation of larger and more heterogeneously shaped granule structures that underwent prolonged exteriorization. Pharmacological inhibition of IKK-β during IgE-dependent stimulation strongly reduced the time partition between signaling and secretion, inhibited SNAP23/STX4 complex formation, and switched the degranulation pattern into one that resembled degranulation induced by substance P. IgE-dependent and substance P–dependent activation in vivo also induced different patterns of mouse MC degranulation that were associated with distinct local and systemic pathophysiological responses. These findings show that cytoplasmic granule secretion from MCs that occurs in response to different activating stimuli can exhibit distinct dynamics and features that are associated with distinct patterns of MC-dependent inflammation. Citation Information: J Clin Invest. 2016;126(10):3999-4015. https://doi.org/10.1172/JCI88241. The canonical atrial myocyte (AM) is characterized by sparse transverse tubule (TT) invaginations and slow intracellular Ca2+ propagation but exhibits rapid contractile activation that is susceptible to loss of function during hypertrophic remodeling. Here, we have identified a membrane structure and Ca2+-signaling complex that may enhance the speed of atrial contraction independently of phospholamban regulation. This axial couplon was observed in human and mouse atria and is composed of voluminous axial tubules (ATs) with extensive junctions to the sarcoplasmic reticulum (SR) that include ryanodine receptor 2 (RyR2) clusters. In mouse AM, AT structures triggered Ca2+ release from the SR approximately 2 times faster at the AM center than at the surface. Rapid Ca2+ release correlated with colocalization of highly phosphorylated RyR2 clusters at AT-SR junctions and earlier, more rapid shortening of central sarcomeres. In contrast, mice expressing phosphorylation-incompetent RyR2 displayed depressed AM sarcomere shortening and reduced in vivo atrial contractile function. Moreover, left atrial hypertrophy led to AT proliferation, with a marked increase in the highly phosphorylated RyR2-pS2808 cluster fraction, thereby maintaining cytosolic Ca2+ signaling despite decreases in RyR2 cluster density and RyR2 protein expression. AT couplon “super-hubs” thus underlie faster excitation-contraction coupling in health as well as hypertrophic compensatory adaptation and represent a structural and metabolic mechanism that may contribute to contractile dysfunction and arrhythmias. Citation Information: J Clin Invest. 2016;126(10):4016-4029. https://doi.org/10.1172/JCI87306. Cerebral malaria is characterized by cytoadhesion of Plasmodium falciparum–infected red blood cells (Pf-iRBCs) to endothelial cells in the brain, disruption of the blood-brain barrier, and cerebral microhemorrhages. No available antimalarial drugs specifically target the endothelial disruptions underlying this complication, which is responsible for the majority of malaria-associated deaths. Here, we have demonstrated that ruptured Pf-iRBCs induce activation of β-catenin, leading to disruption of inter–endothelial cell junctions in human brain microvascular endothelial cells (HBMECs). Inhibition of β-catenin–induced TCF/LEF transcription in the nucleus of HBMECs prevented the disruption of endothelial junctions, confirming that β-catenin is a key mediator of P. falciparum adverse effects on endothelial integrity. Blockade of the angiotensin II type 1 receptor (AT1) or stimulation of the type 2 receptor (AT2) abrogated Pf-iRBC–induced activation of β-catenin and prevented the disruption of HBMEC monolayers. In a mouse model of cerebral malaria, modulation of angiotensin II receptors produced similar effects, leading to protection against cerebral malaria, reduced cerebral hemorrhages, and increased survival. In contrast, AT2-deficient mice were more susceptible to cerebral malaria. The interrelation of the β-catenin and the angiotensin II signaling pathways opens immediate host-targeted therapeutic possibilities for cerebral malaria and other diseases in which brain endothelial integrity is compromised. Citation Information: J Clin Invest. 2016;126(10):4030-4044. https://doi.org/10.1172/JCI85129. In addition to the infectious consequences of immunodeficiency, patients with Wiskott-Aldrich syndrome (WAS) often suffer from poorly understood exaggerated immune responses that result in autoimmunity and elevated levels of serum IgE. Here, we have shown that WAS patients and mice deficient in WAS protein (WASP) frequently develop IgE-mediated reactions to common food allergens. WASP-deficient animals displayed an adjuvant-free IgE-sensitization to chow antigens that was most pronounced for wheat and soy and occurred under specific pathogen–free as well as germ-free housing conditions. Conditional deletion of Was in FOXP3+ Tregs resulted in more severe Th2-type intestinal inflammation than that observed in mice with global WASP deficiency, indicating that allergic responses to food allergens are dependent upon loss of WASP expression in this immune compartment. While WASP-deficient Tregs efficiently contained Th1- and Th17-type effector differentiation in vivo, they failed to restrain Th2 effector responses that drive allergic intestinal inflammation. Loss of WASP was phenotypically associated with increased GATA3 expression in effector memory FOXP3+ Tregs, but not in naive-like FOXP3+ Tregs, an effect that occurred independently of increased IL-4 signaling. Our results reveal a Treg-specific role for WASP that is required for prevention of Th2 effector cell differentiation and allergic sensitization to dietary antigens. Citation Information: J Clin Invest. 2016;126(10):4045-4060. https://doi.org/10.1172/JCI86042. Transcriptional reactivation of telomerase reverse transcriptase (TERT) reconstitutes telomerase activity in the majority of human cancers. Here, we found that ectopic TERT expression increases cell proliferation, while acute reductions in TERT levels lead to a dramatic loss of proliferation without any change in telomere length, suggesting that the effects of TERT could be telomere independent. We observed that TERT determines the growth rate of cancer cells by directly regulating global protein synthesis independently of its catalytic activity. Genome-wide TERT binding across 5 cancer cell lines and 2 embryonic stem cell lines revealed that endogenous TERT, driven by mutant promoters or oncogenes, directly associates with the RNA polymerase III (pol III) subunit RPC32 and enhances its recruitment to chromatin, resulting in increased RNA pol III occupancy and tRNA expression in cancers. TERT-deficient mice displayed marked delays in polyomavirus middle T oncogene–induced (PyMT-induced) mammary tumorigenesis, increased survival, and reductions in tRNA levels. Ectopic expression of either RPC32 or TERT restored tRNA levels and proliferation defects in TERT-depleted cells. Finally, we determined that levels of TERT and tRNA correlated in breast and liver cancer samples. Together, these data suggest the existence of a unifying mechanism by which TERT enhances translation in cells to regulate cancer cell proliferation. Citation Information: J Clin Invest. 2016;126(10):4061-4061. https://doi.org/10.1172/JCI89436.